The DEWALT 12-Volt Max 3/8-Inch Impact Wrench is designed to fit into tight places and deliver up to 1,150 inch-pounds of torque. 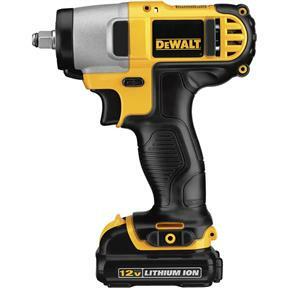 The 6-1/4-inch impact wrench offers user-friendly features, like LEDs and a lightweight 2.3-pound body. The 3/8-inch Hog ring anvil chuck makes for quick socket changes. Two quick-charging lithium-ion battery packs are included. At 6-1/4 inches long, the DEWALT 1/4-Inch Impact Wrench is designed to fit into small spaces where traditional impact drivers don't. The length of the DEWALT means you can apply maximum leverage, enabling you to get the most from this impact driver's 1,150 inch-pounds of torque. Additionally, the DEWALT's three LEDs--mounted radially around the barrel--will light your target area for better visibility. 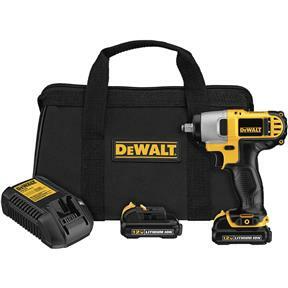 With its 2.3 pounds distributed evenly between its ergonomic body and compact battery pack, the DEWALT is easy to lift and handle. The 3/8-inch Hog ring anvil chuck makes for quick and easy socket changes. This wrench kit comes with two 12-volt max lithium-ion battery packs, fast charger, and contractor bag.